YEREVAN—Azerbaijan opened fire on the Armenia-Azerbaijan border in Tavush during a regular monitoring mission of the OSCE on Thursday. 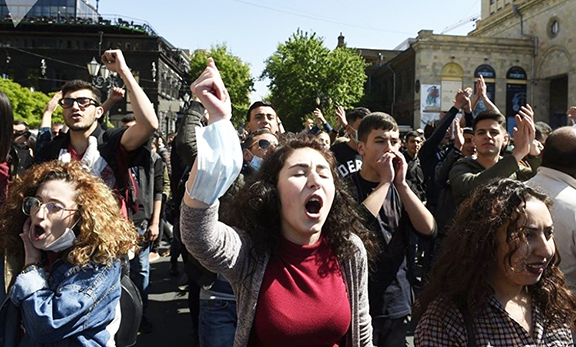 On a related note, the OSCE closed its offices in Yerevan after months of negotiations to keep the international organization’s presence in Armenia reached an impasse. Armenia’s Defense Ministry spokesperson Artsrun Hovhannesyan said the Azerbaijani shots were fired at the Chinari village in Tavush, the site of numerous attacks on Armenian border posts by Azerbaijan in the last several months. The Personal Representative of the OSCE Chairman in Office, Andrzej Kasprzyk , was leading the monitoring mission when it came under fire in Chinar. In the past, during similar missions on the Artsakh-Azerbaijan border, the Azerbaijani side has failed to show up. “Azerbaijani armed forces opened fire during OSCE monitoring on the state border with Armenia,” Armenia’s Foreign Ministry spokesperson Tigran Balayan tweeted on Thursday. The OSCE did not issue a statement on the incident. Corrupt Aliyev and his corrupt family will never make peace to keep embezzling the oil and gas money that belong to Azeri people. The OSCE should issue strong statement as soon as possible on the incident. Take action without wasting any time. What kind of organization is this?